I offer several classes a year. For each session, I take a maximum of three students. Classes are taught in my shop and begin on a Sunday. The class concludes the following Saturday for a total of seven days. Class begins each day at 8 am and ends at 6 pm. The shop remains open for those wishing to work after 6. Over the course of the week, students are guided through the steps of making parts and assembling a chair. All materials are provided as are all tools; however, students are welcome to bring their own tools to the shop. I am also happy to offer advice on care and use of their tools as well. Day one begins with a demonstration on how to choose a log, lay it out, split it with wedges and then use a froe to accurately rive out stock. Next, we move to the shaving horse where we shape spindles, arm bows and/or combs with a drawknife and finish with a spokeshave. Parts are then steamed and bent. On day three we move to the seat of the chair. Material for the seat is a single board of Eastern White Pine. In order to save time, I flatten seats prior to class but I demonstrate how this is done with a hand plane. Next, students will bore spindle and leg holes with a bit brace and an auger bit. After boring, comes the carving of the seat. Students will use a variety of tools for this step including: adze, scorp, travisher, drawknife, spokeshave and scrapers. Due to the nature and difficulty of lathe work, turnings for the chair are provided. They are split from logs of hard maple and turned by either myself, Elia Bizzarri, or Greg Pennington. They are of the highest quality. On day six we begin assembly. Students are given a choice of using a bit brace with spoon bits or auger bits or a cordless drill with brad point bits. I use few jigs or other crutches. I prefer to teach the student how to rely on their hands and eyes. No power tools ( except with the possible use of the cordless drill) are needed or used by the students. 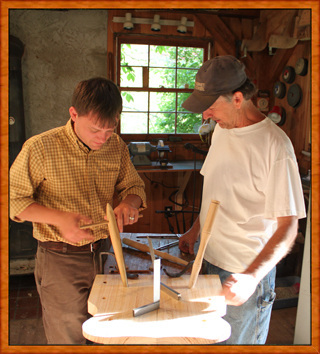 While a Windsor chair is traditionally painted, there is not enough time to paint the chair during the class week. Obviously, questions will arise during the workshop covering everything from sharpening to turning to paint to the origins of the universe. These will all be dealt with as time permits. *Advanced class—space is limited to students who have completed one of my other classes.